This activity is an addition to Pam's comparisons chart which includes pre-printed graphs to accommodate ... (more)seat work activities without using screenshot tools. This handout uses the Claim, Evidence, Reason Framework where students are given a position vs. time grap... (more)h of a cart's movement and must make a claim describing the cart's movement and then provide evidence and reasoning to support the claim. This lesson is designed to help students discover Newton's 2nd Law using the Smarter Science inquiry fram... (more)ework. This is a lesson that provides an introduction to acceleration that I use prior to the fan cart physics. ... (more) I did this as a teacher demo. 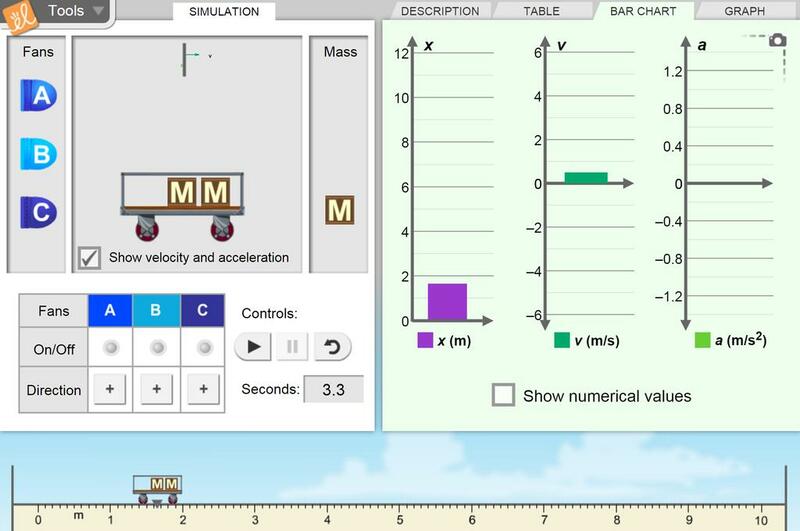 A formative assessment designed using the Gizmo snapshot tool, to allow students to look at the effect of... (more) force and mass on velocity. Newton's Second Law. Requires NO equipment! This Gizmo works great to show direct variation of acceleration with force and inverse variation of acceleration with mass.